On Saturday February 20, 2016 Linux Mint project leader Clement Lefebvre confirmed that the website of the community-driven operating system had been hacked. 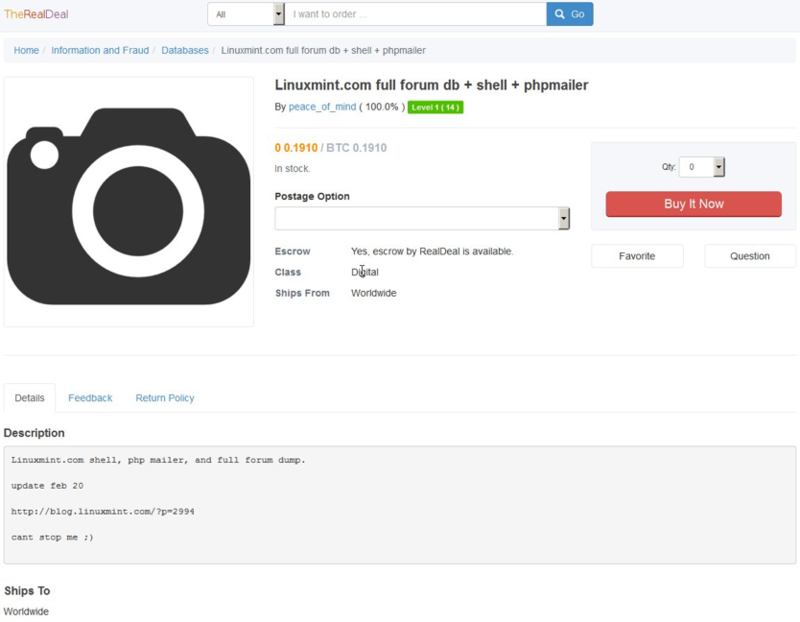 An attacker by the handle of “peace_of_mind”, is claiming responsibility for the hack of the site, deceiving users into downloading a version of Linux that contained a maliciously-placed backdoor. Any personal information you might have put in your signature/profile/etc. The data from the forum hack is already for sale on a dark web marketplace, selling for 0.191 Bitcoin, or $85 USD per download. According to the notification site ‘Have I Been Pwnd’, there has been 71,000 known exposed accounts. If you think you may be affected by this breach, we recommend that you search the database here. Lefebvre suggests that if you still have the burnt DVD or USB stick, boot a computer offline (turn off your router if in doubt) with it and let it load the live session. Once in the live session, if the file /var/lib/man.cy, is present, it’s an indication of an infected ISO. The hacker, “peace_of_mind”, spoke to Zach Whittaker from ZDNet in an encrypted chat on Sunday stating that a “few hundred Linux Mint installs were under his control.” He also claimed that he had stolen an entire copy of the site’s forum twice, on January 28 and again on February 18. Peace_of_mind continued to explain the attack, stating that he found a vulnerability that granted him unauthorized access, and using administration credentials (that he would not explain how he acquired them) logged on to the admin panel. Once in, he replaced one of the 64-bit Linux images with a modified version that had a backdoor. Peace_of_mind claimed that there is no specific goal to the attack, but that their motivation was to build a botnet. Whittaker reached out to Dutch threat intelligence analysist Yonathan Klijnsma, to help substantiate some of the claims. The attacker used malware dubbed as Tsunami, a “manually configured bot that talks to an IRC server and joins a predefined channel, with a password if set by the creator”. This bot can also download files to be executed at a later date, as well as uninstall itself to minimize evidence left behind. Lefebvre has taken the website down, and there is no timeline for when the site will be back online. Follow us on LinkedIn and Twitter for current company and industry news.